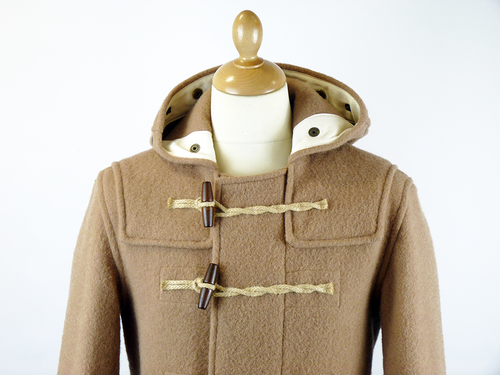 GLOVERALL 'MOD LENGTH MONTY' 3210 MENS RETRO SIXTIES MOD DUFFLE COAT (Beige) - Made in England. Mid Length Monty 3210 Mens Duffle Coat - Named after Field Marshall Montgomery this fab Mens Retro masterpiece is a nostalgic re-working of the original WWII Naval Duffle Coat. The epitome of pure Vintage style with a modern Indie fit. Gloverall expertly take their outerwear classic, the Mens Duffle Coat and work it into a slimmer fitting version of their iconic originals. A Retro Clothing classic complete with genuine wooden toggles and jute rope fasteners. An authentic Sixties Mod classic reworked. 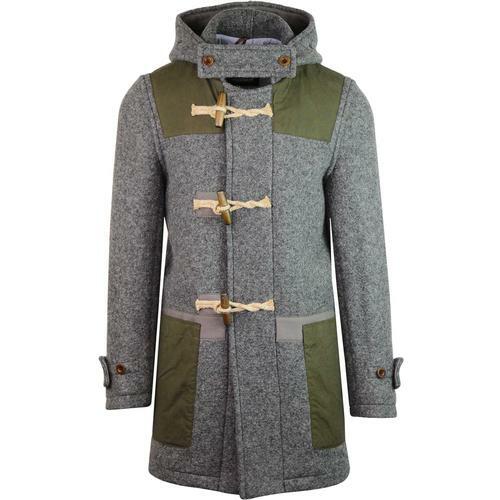 The Gloverall 'Mid Length Monty' 3210 Mens Melton duffle coat in a fab Retro colour way. Made in England. 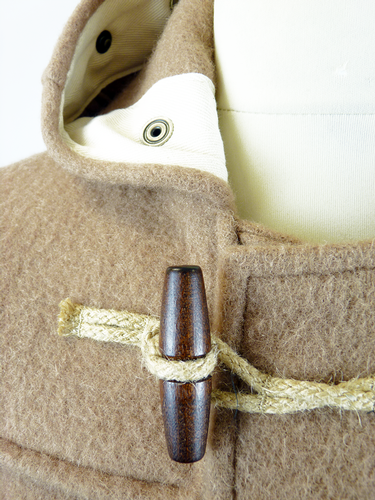 Everything is so much more awesome in a Gloverall Duffle Coat - Mens beige classic 3210 Mid Length Monty Mod duffle coat with Vintage style jute rope loop fasteners and varnished wooden toggles. Traditional Retro duffle hood, oversize Vintage style pouch pockets and classic Sixties style Heritage storm guard to protect the neck from the elements. This can be fastened away if desired. 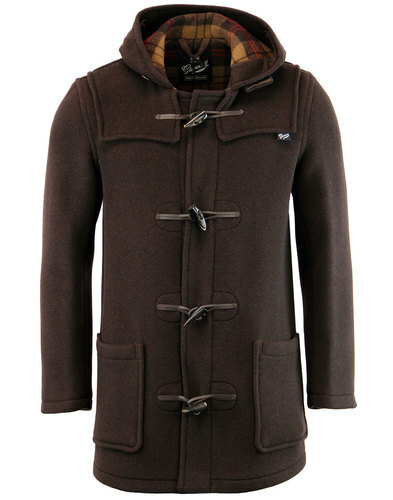 The recognisable Duffle Coat fixed shoulder cape adds a cool Mod flair and provides extra durability and warmth. Made in England from finest Italian cloth and finished with a visually appealing Sixties Mod herringbone webbing interior trim. Military Indie tab and snap stud detail to the cuffs. 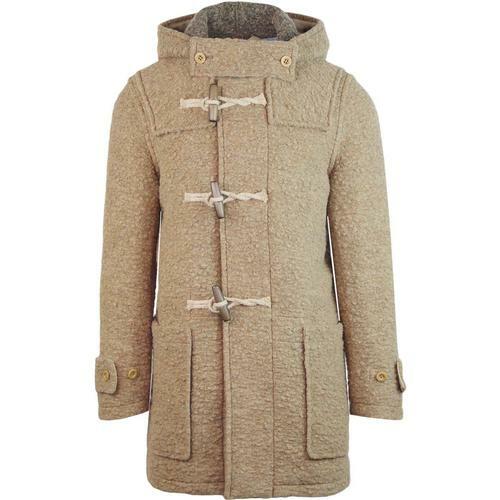 This mid length Monty 3210 boiled wool duffle coat is the ultimate Winter warmer. With an Indie swagger like no other. 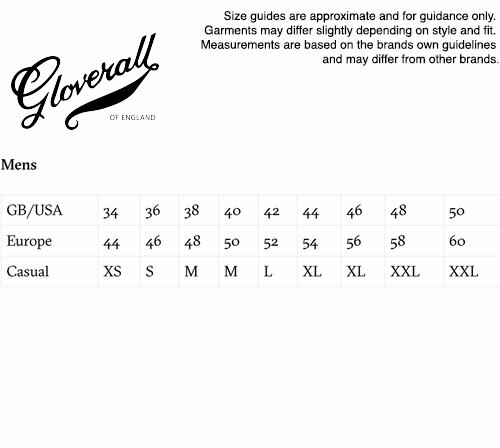 Gloverall of England. British Tradition - Authentic Duffles. Morris's (Gloverall's founders) were approached by the MOD (Ministry of Defence) after the Korean War to dispose of surplus supplies of Naval Duffle Coats. 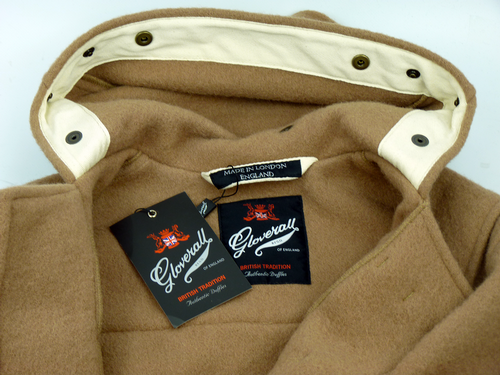 The 3210 'Monty' Duffle Coat is based on that original design. 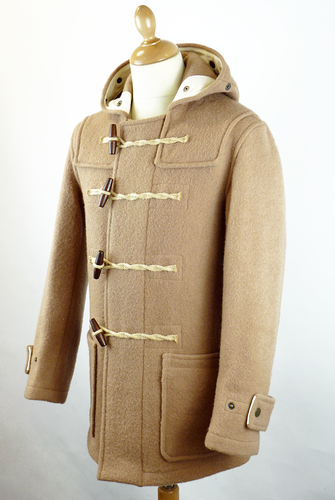 GLOVERALL 'MID LENGTH MONTY' 3210 MENS RETRO SIXTIES MOD DUFFLE COAT WITH WOODEN TOGGLES. MENS 3210 'MID LENGTH MONTY' RETRO SIXTIES MOD DUFFLE COAT by GLOVERALL - Mens beige Retro 3210 'Mid Length Monty' duffle coat by Gloverall. Vintage style varnished wood toggles with jute rope fastener loops. Classic Mod duffle hood, oversize pouch pockets to sides and detachable storm guard to the collar for that Sixties Country Heritage look. Fixed shoulder cape for extra strength and warmth and cool Retro herringbone webbing inner trim. Vintage tab and stud feature to sleeves. Made in England from finest Italian Cloth. '3210' Mid Length Monty Mens Gloverall Duffle Coat. 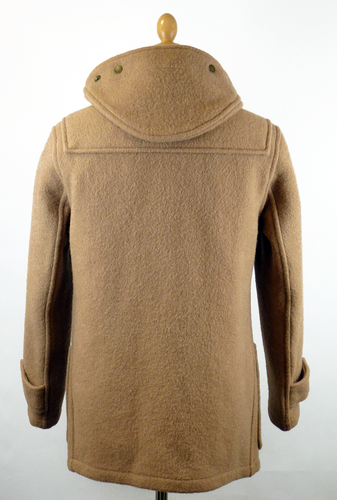 Composition: Outer - 90% boiled wool, 10% polyamide. 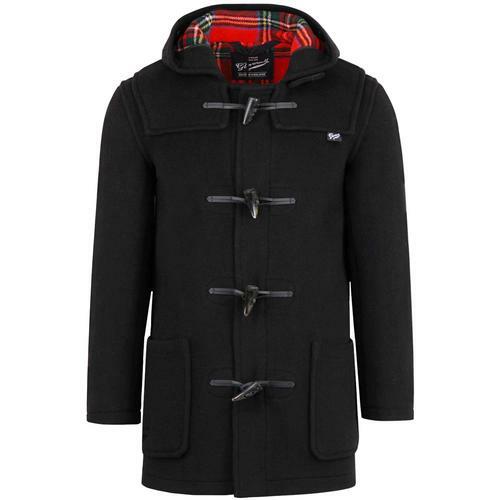 SKU: 3210 52 'Mid Length Monty' GLOVERALL Duffle Coat. 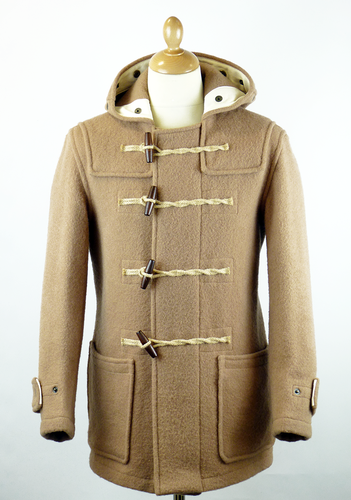 GLOVERALL 'Mid Length Monty' 3210 Mens Retro Sixties Mod Duffle Coat with Wood Toggles (Beige). Regular fit. Average length approx. 89cm.